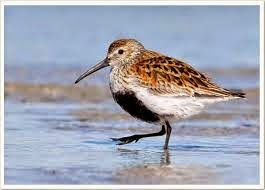 Hi to all Shorebirders and Whimbrellizers in particular. Today at Colonel Sam Smith Park was so different from yesterday I don't know where to start. But isn't that just like nature? 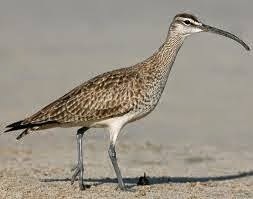 The boys in Virginia reported 2,361 Whimbrels leaving their shore last night to make a total so far of 5,739 birds. Not exactly darkening the skies but at least we're learning about them. Maybe even in time to save them? Remember last night when I asked if anybody out there could unravel the mystery of only 3 birds in Toronto when 1,548 left Virginia? It might have been Freddy Bodsworth but probably one of the reasons below. I was told there are several different paths the Birds may take when they decide to leave their staging areas in Virginia take, with Toronto and CSS Park in particular being but one of the birds' favourite fly-overs. Virginia says a bird tracked by satellite transmitter may take from 9 to 11 hours to get here. So if they say Wally Whimbrel with his radio transmitter left the beach between 5;45 and 6:15 last night we should expect to see Wally and his "Fling" (collective noun for Whimbrels - isn't scholarship wonderful?) by late afternoon unless they've gone via Rochester or whatever. You can actually follow some of the birds in real time on the website called Seaturtle.org - http://www.seaturtle.org/search.shtml?cx=partner-pub-9193338284454234%3A2zdd5d-zgk8&q=whimbrel&cof=FORID%3A9 and of course see bits of alternate routes through this report. So they reckon we in Toronto and you and me at Sam Smith may on an average day get around a third of the birds from Virginia if we're lucky. Thanks so much Virginia. All my birdgroupies are going to wanna have your babies. Next time around I'm thinking of doing my PhD on factors affecting the migration of birds, Whimbrels in particular. (I don't actually have a PhD but I've thought about it before). By the time I got set up to watch for them the total was over 320. The rest came between 3 and 4 pm. so the total for today was 406, and the grand total from May 19 to date is now 1,210 birds. 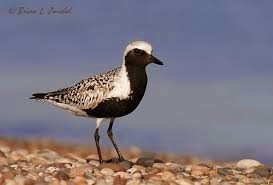 Wayne and I were both recording so furiously at some points that it may be better to let Wayne tell his own story but there were Blackbellied Plovers that flew through like arrows and one of my most favourite, Dunlins. By the thousands I reckon. The Dunlins, accompanied by a few Semipalmated Sandpipers stuck around to entertain us (sorry, anthropormophification error but don't you think Dunlins are a candidate for Worlds' Cutest Bird?) 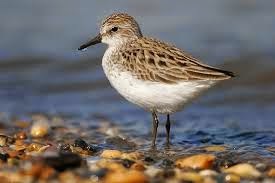 Everybody who came out to the Park, all the casual users with kids and dogs and barbecues and Grandma, was treated by the Dunlin display and, coupled with some inspiration provided by us, I'm sure emerged from the experience much improved human beings. Except for the dogs. Late afternoon there was a heads-up event brought to you by Mr. Peregrine Falcon who swooped through an enormous but slightly mixed up and complaining flock of little shorebirds and to emerge with a Dunlin in his grasp. 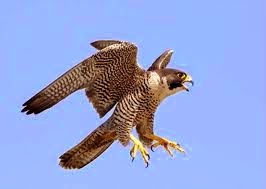 Was he a resident Peregrine? And if so, from where? Awards consisting of a Timbit for the sharpest eyes went to Kris Ito in the womens' category and were shared in the young mens' category by Henrique Pacheco and Adam Caparelli while the award for the most enthusiastic (and toughest young birder blackbelt did he say?) went to Ben Harrison. Seeing these young fellows be such keen birders makes me a little more comfortable about the future of the world. And I would almost, but not quite, trade my gold medal ears for their incredibly sharp young eyes, and my years of experience for their contagious enthusiasm. And thanks, Mom. Folks who made the day so pleasant I wish they were on board every day were, in rough order of appearance, Wayne Renaud, Dave Pryor, Vivik Kumar, Jean Iron, Ron Pittaway, Huey Mcneil Bruce Wilkinson, Mark Cranford, Garth riley, Howard Shapiro, Herb Elliott, John Fitzsimmons, Lynn Pady, Debbie Pacheco, Moni Harrison, a lady named Adair whom I was so entraced by I forgot to ask her last name, a fellow named Mark, who I personally supervised the transition from a fairly ordinary bystander to a raving birdgeek in just 48 hours, and about a dozen other people who shall remain nameless for the moment through no fault of their own. I should have been recording but I got so excited I jumped up and hollered like everybody else! Colonel Sam Smith Park. What a place. Located at the South end of Kipling Avenue in Toronto. There is free parking in the south lot but you should leave a note on the dashboard that you are birding. Eat at Timmies, use the facilities there, bird yourself crazy up in the Bowl and Dogwood Patch and then come down to see us at Whimbrel Point. What a day!